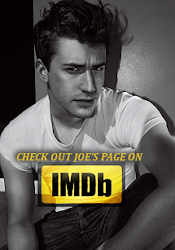 Love Joe Mazzello: First Kiss will be released online on October 29th! First Kiss will be released online on October 29th! First Kiss, the short film that Joe stars in alongside Brenda Song will finally be able to be viewed online soon! It will be released on Monday morning, October 29th on the director's Vimeo channel here. You can also check the First Kiss Facebook page for any additional information about the film's online release. First Kiss is now available to watch online!